Pulling of this real estate transaction takes some skills and patience and I’m happy to say we accomplished the task without losing too much sleep! Carmen needed to sell her large pool home and downsize in to something smaller and easier to maintain. So we started off listing her house and just as she considered taking it off the market we got a great offer! Now began the juggling act – trying to close her pool home as well as find something that she could easily move in to. At first I thought the process might be a struggle because Carmen was used to her exceptionally clean home and most of the listings in Port St Lucie are foreclosures or short sales that need a bit of TLC and cleaning before move-in. But then we walked in to the brand new two-story townhouses at the Villas of Torino and Carmen immediately looked at me and exclaimed “This is for me!” Boy do I love when that happens. Let me tell you how impressed I am with these Mercedes-built townhomes. I hadn’t toured them before and the 2-story corner units are fabulously spacious. You barely know you’re in a townhouse when you’re in the living room and the ceilings are two floors high! 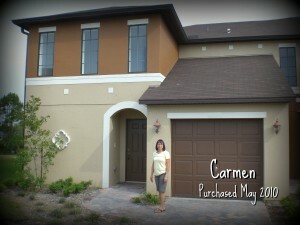 So we pulled it off – Carmen sold her pool home on a Tuesday and used the cash to buy the Villa in Torino the next day. The buyers of her pool home were gracious enough to allow her a few days extra to coordinate her move in to the Villa. Now Carmen won’t have to worry about her lawn or keeping her pool clean because that’s all taken care of at the Villas of Torino! She also has a blank canvas to start with as the home is brand-new and never lived in. And the new buyers of her pool home can start a happy life together. Don’t you love when dreams come true?